Tracey Concrete post and rail fencing are manufactured to I.S. 252 1982 using a drycast system which produces a dense durable concrete. The fence should be constructed to give a visually pleasing flowing alignment with no abrupt changes in vertical profile. 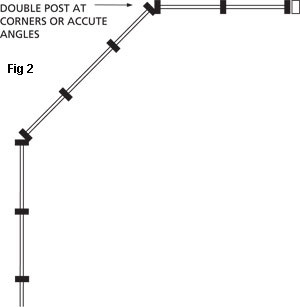 Posts should be placed at 2505mm centres with double post at corners, acute angles or where specified. See Fig 2. 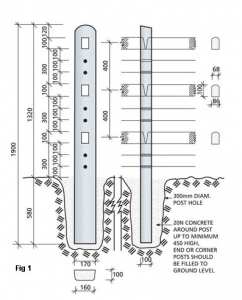 The holes for posts are normally bored with a 300mm diameter auger, 600mm deep. 20N concrete, min. 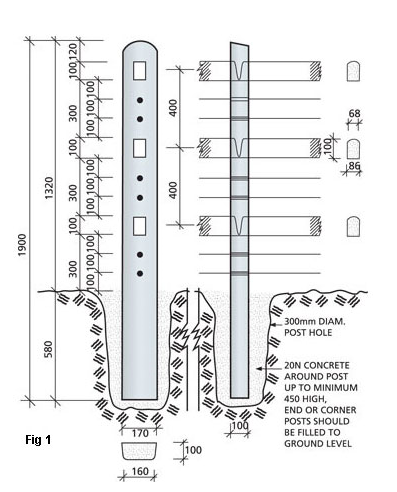 450 deep should be placed around post except for end, corner or strainer posts where hole should be filled to top. It is advisable to make a jig for the accurate spacing of post as they are erected and the top rail may be placed in position at this time also. Galv. Line Wire may be fed through the holes in posts were necessary or specified. Proper straining ratchets should be used to tension wire. As there is no strut to prop straining post, avoid over straining specially on top wire which would put unnecessary pressure on post. It is advisable in this case to grout the slots around the rails in the first panel of fence which will distribute the stress to the second post also.